NASA’s Dawn spacecraft, launched in September 2007, ended its long journey today. After failed communications and subsequent analyses of the cause, scientists concluded Dawn ran out of hydrazine fuel. This comes as no surprise as NASA announced in October 2017 that the mission would be extended until Dawn's hydrazine fuel run out about the latter half of 2018. 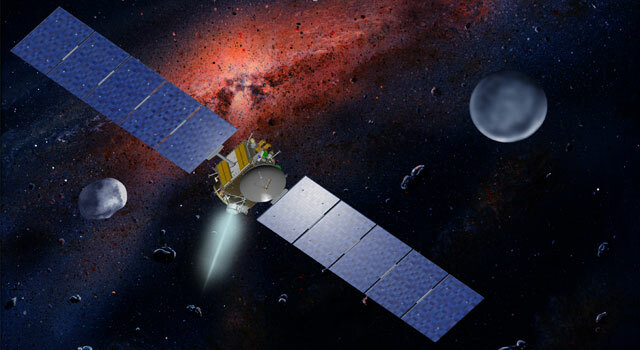 Dawn’s mission focused on Vesta and Ceres, two protoplanets within the asteroid belt, to characterize the conditions and processes that shaped our solar system. From July 2011 to September 2012, Dawn orbited Vesta. In 2012, Dawn began surveying Ceres, its final destination. The spacecraft itself, although no longer active, will remain in orbit for at least 20 to 100 years. “Today, we celebrate the end of our Dawn mission – its incredible technical achievements, the vital science it gave us, and the entire team who enabled the spacecraft to make these discoveries,” said Thomas Zurbuchen, associate administrator of NASA’s Science Mission Directorate in Washington. Dawn will be forever known as a mission with many firsts. The data Dawn radioed back to Earth will enable scientists to test and refine hypotheses and likely make even more incredible discoveries. The Dawn mission was managed by JPL for NASA's Science Mission Directorate in Washington. Dawn was a project of the directorate's Discovery Program, managed by NASA's Marshall Space Flight Center in Huntsville, Alabama. JPL was responsible for overall Dawn mission science. Northrop Grumman in Dulles, Virginia, designed and built the spacecraft. The German Aerospace Center, Max Planck Institute for Solar System Research, Italian Space Agency and Italian National Astrophysical Institute are international partners on the mission team. Find out more about the Dawn Mission.